Firstborns were born to win. Clearly the natural movers, shakers, and leaders of this world, they can accomplish anything they set their minds to. They're the high achievers, the benchmark-setters, the business moguls, the concert violinists, the heads of the PTA. But if they're out of balance, they can be overly perfectionist, driven, and critical. They can become controllers (everything has to go their way) or pleasers (exhausting themselves in meeting the demands of others). 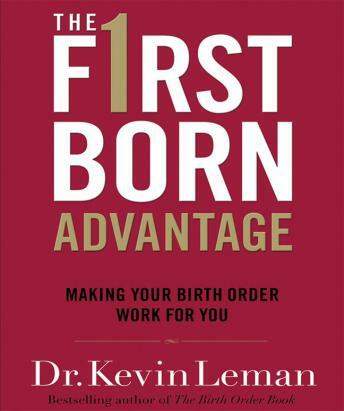 In The Firstborn Advantage, bestselling author, humorist, and internationally known psychologist Dr. Kevin Leman identifies the qualities of firstborns...and there's a hook. Just because you're the firstborn child in the family doesn't mean you'll have a firstborn personality. You can be #3 in a group of 4 siblings, and still have a firstborn personality! Dr. Leman reveals why. He helps firstborns understand their natural advantages--while becoming aware of their weaknesses and learning how to sidestep them--for the highest level of personal success at home, at school, at work, and in relationships. This fun, informative, and practical book will keep readers engaged and provide many "aha!" moments.